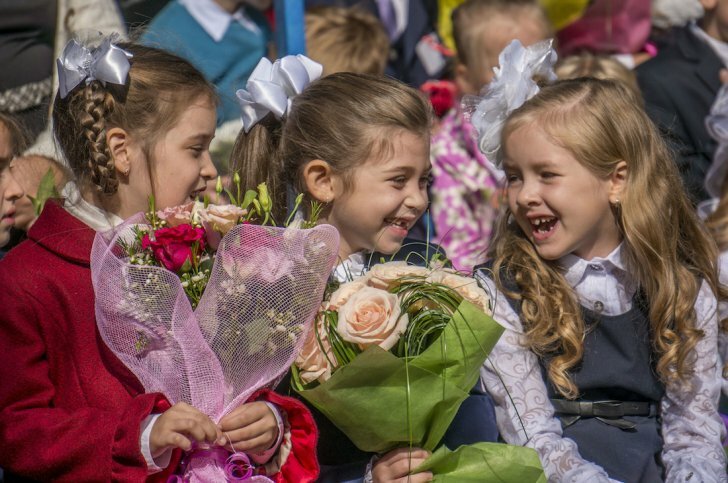 I had no idea the first day of school in Russia is such a big celebration, with flowers and festivities. I never noticed before, but I see a lot of photos from my Russian friends on Facebook, with boys and girls dressed up and bright flowers in their arms. It's a beautiful tradition! Personally I always hated school, at every level. This is a strange statement for someone like me who has spent half of my life in some type of educational institution - 2 years of preschool, 12 years to get a high school diploma, 4 years for my university degree in English/Writing and then another 5 years to get my doctorate in law. Total = over 20 years!! In the U.S., we don't have such a big celebration for the first day of school. I think it's completely different, though each parent still posts photos of their kids with their backpacks and books. My nephew started second grade yesterday, and I watched him get on the school bus. I never once had the urge to have a child, or carry such a huge responsibility for another human. I look at my sister, working full time, constantly running from place to place with my nephew. One day it's karate lessons, the next soccer practice, a friend's birthday party....the list is endless. Sometimes I look at her and feel relieved that I have absoultely no responsibility. Not for a child, or a husband, only myself and family. Free to do as I wish, when I want. It sounds selfish to many, but this is the reality in which I live and I have never wanted it any other way. 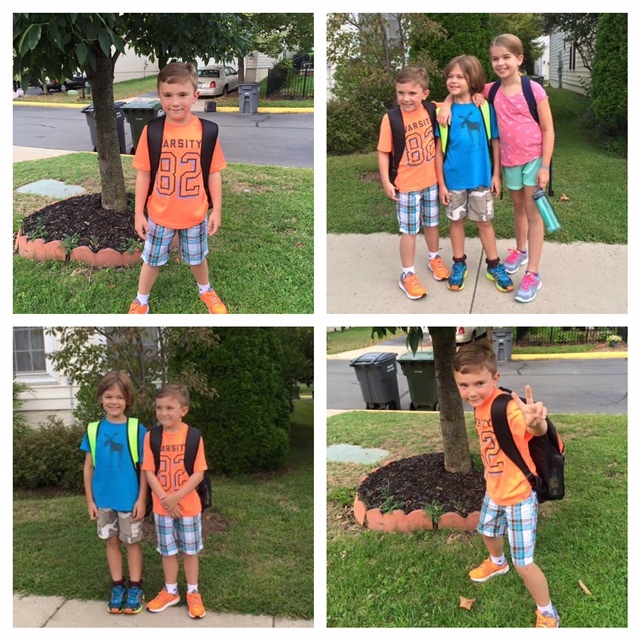 A few photos from my nephew's first day of school yesterday. In the U.S., most kids take a bus to school. It's my understanding that school buses are basically nonexistent in Russia, but maybe I'm wrong? It seems like a lot of Russian school children wear a standard uniform, but in the U.S. such uniforms are usually only worn at private or religious schools. I'm completely opposed to uniforms because I've always viewed clothes and the manner in which a person dresses as a form of expression and individuality. When everyone looks the same, the landscape becomes boring! At the same time, I understand that uniforms eliminate a lot of peer pressure and bullying to look a certain way, or wear a certain brand, and there's certainly some value in that. In my youth, I dreamed of being a teacher. I even practiced with my sister and cousins, barking commands at them on my chalkboard, trying to teach them spelling and math. Of course, they were bad students and didn't obey, no matter how hard I tried. 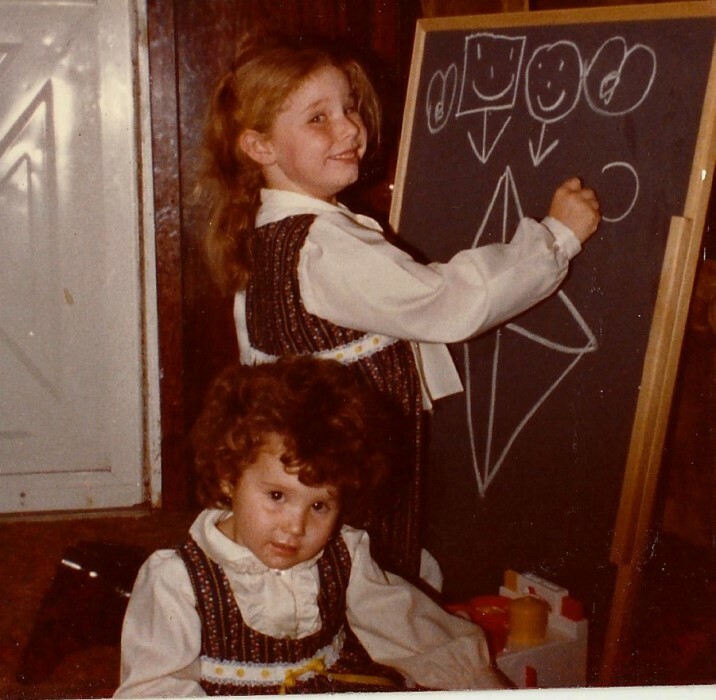 :) Here's photographic evidence of my early career dreams, with my younger sister sitting as an uninterested pupil. My career path was altered when I served as a substitute teacher in a middle school and encountered wild teenage boys! I didn't have the patience to deal with unruly children, despite my desire to imbue them with the powerful gift of knowledge. How about you? Did you like school? Are there any other interesting Russian school traditions? Tell me. :) I think next time I visit the country, it would be great to visit a school and meet some of the young children who will shape Russia's future, hopefully for the better. Finest school traditions in Chechnya. Policemans go to school for fighting with boys, police officers (major, colonel or higher) go to school that find new (or second) wife. It's wonderful tradition! Well, these kids are not in Soviet schools. They live in modern Russia, and based on what readers tell me, education is different now than during Soviet times. I love flowers, and will be happy to receive them on any occasion. :) I've never been inside a Russian school. It's necessary to visit one on my next journey. I loved school and as I did not attend kindergarten, I had been begging my parents to send me to school early. So when I just turned 6, after one week I went to the first grade. Back in 90ties it was very unusual! Besides flowers on the 1st of September (Knowledge Day), we also have Teacher's Day at the first week of October. In university students often celebrate the middle of studies at university. It's called equator. For example, if your overall studies last for 4 years, you celebrate it after the end of second year. I didn't know about "Knowledge Day!" We also have "Teacher's Day" in the U.S., when teachers receive all kinds of wonderful gifts from parents and students. I loved school!! Miss it so much! We have a fun tradition in Russia for the beginning of October - teacher's day. Students and teachers change places. Older students get to teach younger, or even become a principal. It's only for 1 day, but it's so much fun! Sometimes I had a chance to teach several different classes a day! Btw, thank you for a postcard! It was a nice surprise!! Oh, you have already received the postcard? Great! Are you in the U.S.? If not, then that was very fast for Russian Post! Only two weeks. It's a fun idea for students and teachers to switch places! I like it. We didn't have this tradition when I was in school. Personally I hated the formal school celebration (and most of the rest of the school) during all my school life. You have to stay still and quiet in the open sun, and listen to all those pompous, insincere, and amazingly boring speeches. On the contrary, I enjoy quite a lot the easy and informal transition into a new school year that my son has here in the US. Predictable comments so far. Reason for uniforms is simple, they want kids to discuss educational matters not somebody way to dress. School was Ok for me, though not interesting often. But I was nerd then. We have interesting tradition - each class has spot in school they were supposed to repair at year end. Plaster, paint, etc.. I am fairly proficient with plastering since then. I have question for you - in your time in school classes were reshuffled every year as it is now? I was also a nerd in school, and even now! :) What do you mean "classes were reshuffled?" We had the same teacher until 6th grade, and then after 7th grade we switched classes and teachers for each subject. Always kept lunch money in the shoe but had some spare change in the pocket. So nice picture with you and your sister. And picture looks so old. I like old pictures. But here in New York children are still on vacation until 9/9. Isn't it in Virginia? I have a clear and detailed understanding of how russian schools educate nationalists and imperialists. It would be interesting to see how this problem is solved in the United States. I loved soviet school.. It wasn't as bad as some people imagine nowadays. I could give a lot to go back in my school at those days. Your English is fine! :) How was Soviet school different than modern day Russia schooling? Did I like the school? But I did love to win (and still do). By the 7th grade I moved to another school, to a class, which was the first phys-math class in the district. We all had to pass the exams to qualify, so we were a mashup of best pupils from different schools. And hools , with tons of parties and fun, at the same time. And based on our results in the 11th grade our school became a so-called gymnasium. My daughter went to her 6th grade today. They do have their school uniform and it's obligatory according to the school rules. Cool! I went to a small school, so we didn't have so many scholastic competitions or debate teams, etc. It's good to be a nerd. :)) How did you convince the principal to abandon uniforms? The students kidnapped him or held him hostage? :)) We did not have uniforms, but had a strict dress code. Females had to wear dresses or skirts, and they could not be above the knee! We also had to wear stockings. It was a complete nightmare. //It's my understanding that school buses are basically nonexistent in Russia, but maybe I'm wrong? You are right. I't very unusuall. But usually it's no problem: for examle, I can reach minimun three schools during 10-15 minutes. Our usual city block is organized around school building with stadium - it's educational center, electional point and (in theory) point for military recruiting and evacuation in wartimes. Also, school can't say no if you want to study there and it's your local school. I hear about school buses in countryside, but as far as I know its rare thing. On photos? It's soviet school uniform. 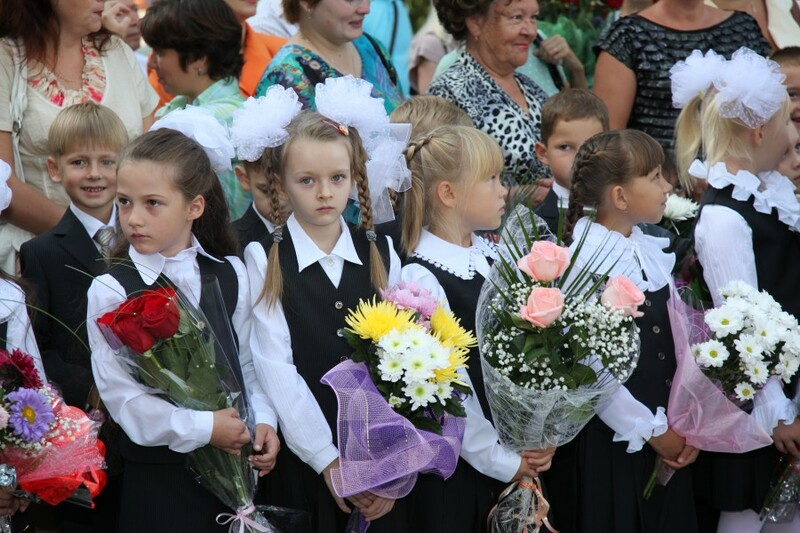 It's traditional clothes for school celebrations: 1st Septembers or last official school day in your life. It seems that even with these traditional Soviet uniforms, there was still some chance to express individuality. Because some girls have ruffled white shirts, some are plain and some have buttons. I've heard many stories of children walking huge distances to schools in remote Russian villages. That's why I thought school buses were non-existent. That is the USSR tradition. I learned at school at the Brezhnev, Androporov, Chernenko and Gorbachev times and those schools differ from modern ones. And yes - there were school buses but for children of distant villages only since usually school is located not far from your house.
" I didn't have the patience to deal with unruly children"